Forex Articles What is a Currency Pair? A currency pair refers to how currencies are quoted and priced in the Forex (foreign exchange) market. To put it in layman’s terms, the value of a particular currency is determined by comparing it with another currency. In a currency pair, the first currency is referred to as a “base” currency, while the other currency is referred to as a “quote” currency. Using a currency pair, one can determine how much quote currency is required to buy a single unit of the base currency. Why Are Currencies Traded In Pairs? The Forex market is just like the stock market. For instance, in a stock market, company shares are sold as commodities in exchange for money. Similarly, when one wants to buy a particular currency, they exchange it with another currency. In order to guide this type of exchange, Forex markets implemented the use of currency pairs. For instance, a common currency pair is EUR (Euro) – USD (US Dollar). 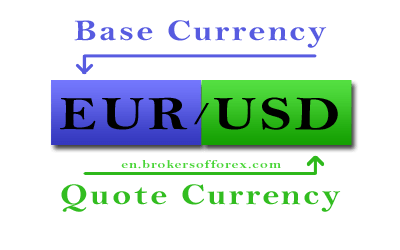 Here, EUR is the base currency or commodity and USD is the quote currency or the money for purchasing the commodity. So, basically, USD is paid to buy EUR. The base currency value is always 1. So, it is read as “1 unit of base currency can purchase x units of quote currency”. Let us take the example of the USD and JPY (Japanese Yen) currency pair. Here, USD/JPY 124.79 indicates that 1 US Dollar can be purchased by exchanging 124.79 Japanese Yen. In other words, 124.7 Japanese Yen equals 1 US Dollar. Currency pairs are purchased, when the trader expects the base currency value to go up in relation to the quote currency or if there is an expected raise in exchange rates. In the same way, a trader might sell a currency pair if there is an expectation that the base currency may drop in relation to the quote currency. Traders can open up trading accounts in any currency and buy any currency with those trading accounts. For instance, if you want to buy EUR, you can even pay your broker in INR (Indian Rupees). The broker will convert your trading account capital (INR) into USD and then execute the purchase for you. In Forex trading, currencies are bought and sold simultaneously. That is, you buy the base currency and sell the quote currency at the same time whenever you purchase a currency pair. Currency pair transactions involve a “bid” and an “ask”. A “bid” is the price at which the base currency is sold and the quote currency is bought, at the same time. An “ask” is the price at which the base currency is bought and the quote currency is sold, at the same time. The “Ask” price is always higher than the “bid” price. The difference between the “ask” price and the “bid” price is known as the “spread”. When it comes to trading currencies, the currencies that are most steady in terms of political and economic conditions are the ones that are always in demand. Since, the US economy is the strongest, the US Dollar or USD is considered as the base currency for quotes and is also, the most traded currency in the market. As mentioned earlier, the most traded currencies are the ones that are economically strong. This includes a list of other currencies apart from the USD. The other strong currencies in the Forex market include the Euro, the Canadian Dollar, the British Pound, the Australian Dollar, the New Zealand Dollar and the Japanese Yen. In currency pairs involving the USD, the base currency will mostly be the USD itself. So, when there is a rise in the quote currency, then it simply means that the value of the USD has appreciated. For example, in the previously used currency pair involving the US Dollar and Japanese Yen, if the JPY value goes up from 124.79 to 125, then it indicates that the US Dollar can afford more of the Japanese Yen. This ultimately means that the US Dollar has grown to be a bit stronger than the Yen. However, there are exceptions to this. In currency pairs involving USD and Australian Dollars, British Pounds or Euro, the USD is usually lower in value and is used as the quote currency. For instance, GBP/USD 1.55 indicates that 1 British Pound can purchase 1.55 US dollars. Here, the higher quote currency indicates that the US Dollar is weaker than the British Pound. Here, Eurozone refers to all the countries that fall under the European Union and use Euro as their currency. These countries include Austria, Belgium, Cyprus, Estonia, Finland, France, Germany, Greece, Ireland, Italy, Latvia, Lithuania, Luxembourg, Malta, Netherlands, Portugal, Slovakia, Slovenia and Spain. In the Forex market, currencies are denoted using their ISO (International Standards Organization) codes. For example, the ISO code for United States Dollar is USD or CHF for Swiss Francs. Just like major currency pairs, you can also find “cross currency pairs”. Cross currency pairs are pairs that do not include the USD or US Dollar. Their rates are calculated according to their USD pair values, however, they are independently quoted with a slimmer spread between the “ask” and the “bid”. This means that you will have to spend more to buy a currency pair. Most cross currency pairs revolve around the EUR, GBP and JPY currencies. For example, GBP/JPY or EUR/JPY and so on. A major advantage with cross currency pairs is that there is no US Dollar conversion required while trading. To put it simply, in a GBP/JPY cross currency pair, the GBP can directly be purchased with JPY. There is no need for the JPY to be converted into USD first. What are exotic currency pairs? Exotic currency pairs involve currencies that are traded rarely. These currencies are usually unstable, which leads to very little trading. Trading such currencies is also expensive, as the ask-bid spread can be very significant. Exotic currencies would include examples such as the Iraqi Denari, Uruguay Peso or the Thai Baht. 2013 Triennial Central Bank Survey, Bank for International Settlements.